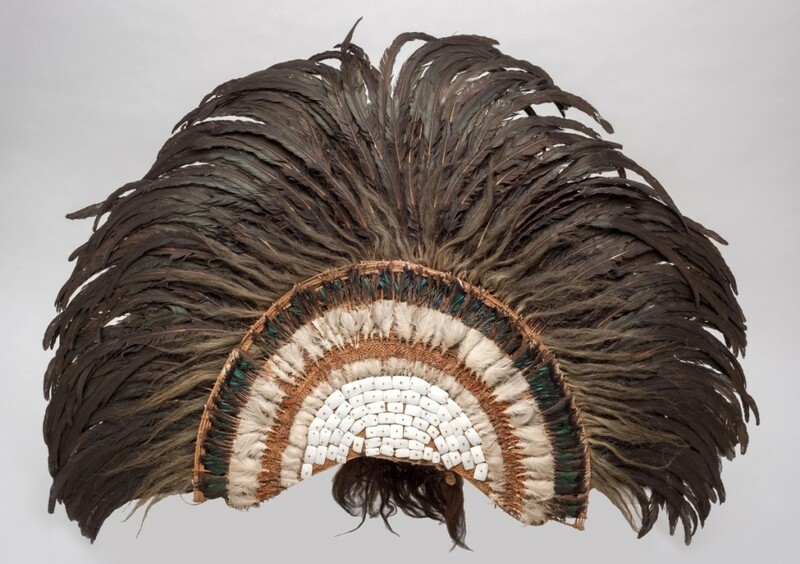 Feather headdress, Austral Islands, Eighteenth Century; feathers, shell, barkcloth, human hair, coconut fiber cord, vegetable fiber (various); 43-5/16 high by 43-5/16 wide by 8¼ inches deep. Peabody Museum of Archaeology and Ethnology, Harvard University Gift of the Heirs of David Kimball, 1899. NEW YORK CITY – The Metropolitan Museum is known for its blockbuster exhibitions that fill large galleries with color, light and sometimes sound. “Atea: Nature and Divinity in Polynesia,” at The Met Fifth Avenue through October 27, is an exhibition apart. Installed in a more intimate space, Gallery 359, this fascinating exhibition celebrates the creative ingenuity of Polynesian artists who drew from the natural world to give material expression to their understanding of the divine. 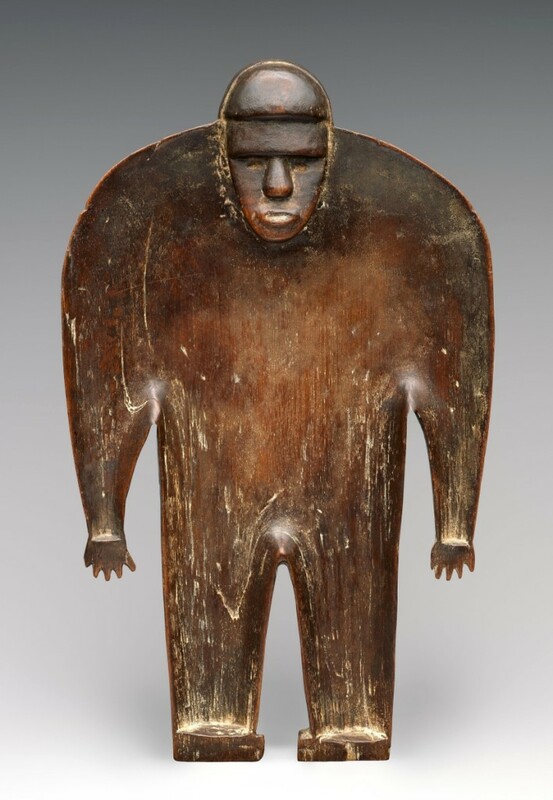 Through some 30 Eighteenth and Nineteenth Century examples of figural sculpture, religious and ritual objects, painted barkcloth, rare featherwork and more, the exhibition offers visitors an opportunity to understand a core principle of Pacific art: the divine is not abstract, but very much alive in nature. The title, “Atea,” refers to the powerful moment when light heralded the birth of the universe beginning with the evolution of marine and plant life, birds, fish and animals and brought about the birth of the first generation of Polynesian gods. Gods and humans sprang forth from the natural environment – the final generation in the great chain of being, who maintained a close kinship with the natural world. Brilliance and shimmer enhanced the effectiveness of ritual objects specifically because they referred back to this moment in time. Polynesians see art as a way to communicate with gods and ancestors. High-ranking chiefs in Polynesia were considered divine because they were direct descendants of the first creator god, Tangaloa. 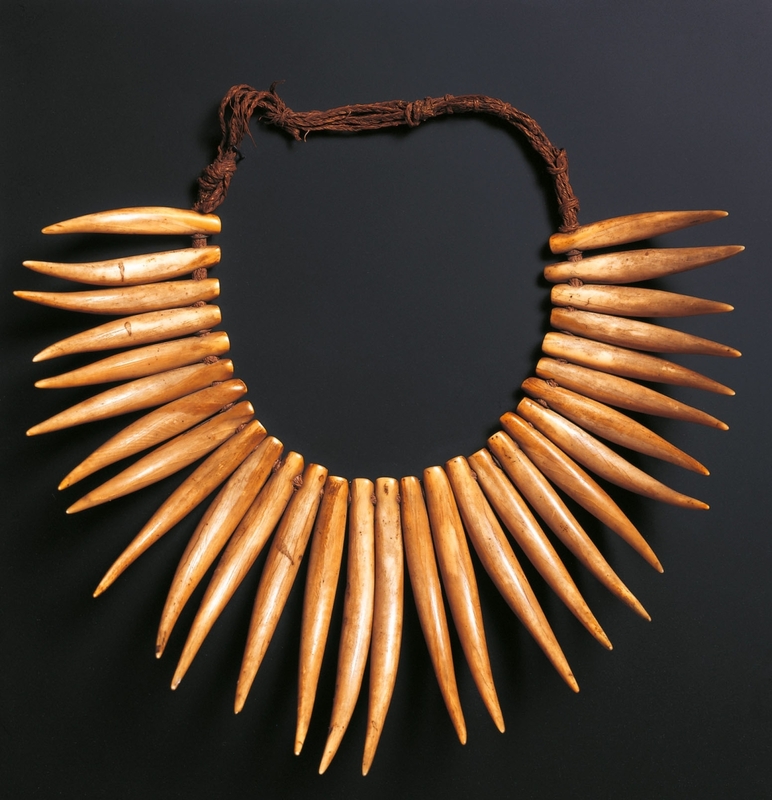 Polynesian artists used whalebone and ivory to create spectacular works of art that were believed to contain Tangaloa’s divine essence. The notion of sacred light is captured and celebrated in one of the great masterworks of Oceanic art in The Met collection: a remarkable shimmering female deity figure carved from a single tooth of a sperm whale. Also on view are examples of the ceremonial garb of chiefly descendants, including a regal headdress from the Austral Islands. Its striated crescent shape echoes a Tuamotuan diagram of the universe; its feather and shell components are believed to function as conduits to the divine. 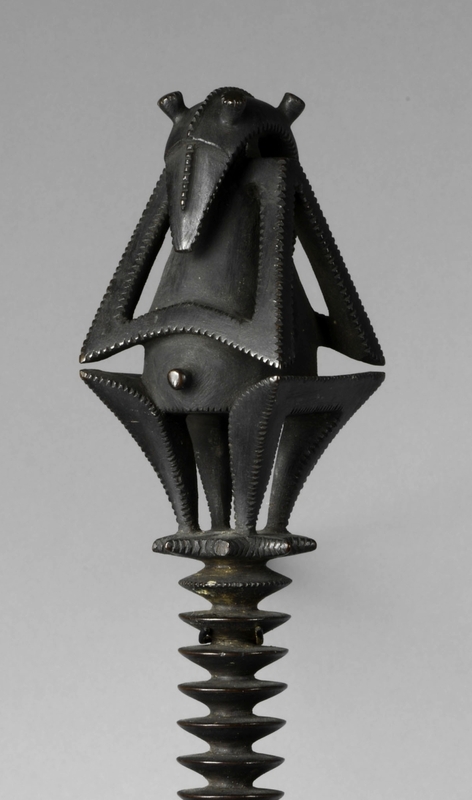 Ritual dish (daveniyaqona), Fiji, early Nineteenth Century, wood, 12¾ inches high by 7¾ inches wide by 2 inches deep. Purchase, 2017 Benefit Fund, Gordon Sze, MD; The Richman Family Foundation; and Steven Kossak Gifts, Andrea Bollt Bequest, in memory of Robert Bollt Sr and Robert Bollt Jr; and Ruddock Foundation for the Arts Gift, 2018. The exhibition is organized chronologically in three sections. The first section, “Ancestral Homelands,” presents key ritual artifacts from the islands of Fiji and Tonga that are the earliest distillation of a distinctly Polynesian ideology. Works on view include a superbly executed figural sculpture of the female goddess Hikule’o, guardian of Pulotu, the watery underworld that remains to this day an important place of origin for islanders; a god house constructed completely from coconut cord fiber; an impressive painted barkcloth; and regalia carved from highly coveted whale ivory and pearl shell. 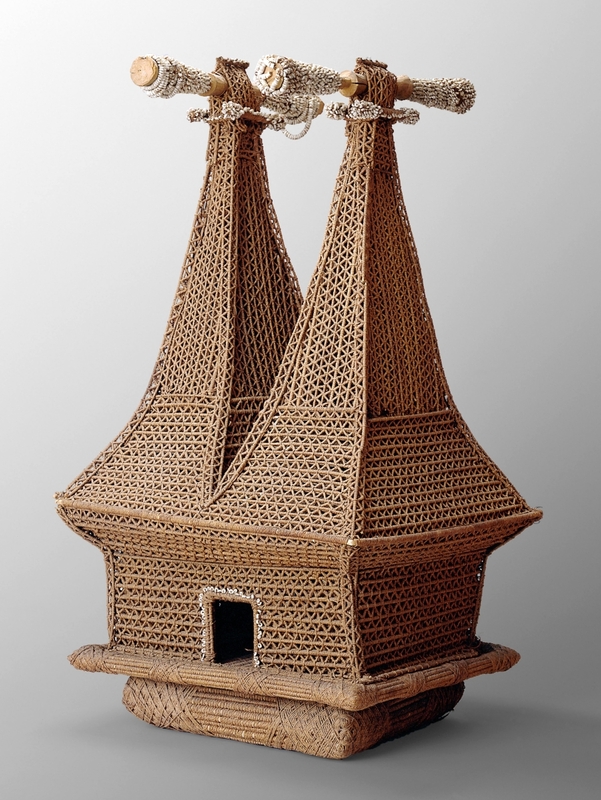 The second section of the exhibition, “Propping up the Sky,” focuses on the dynamism of ritual artworks from central and eastern Polynesia. Here, important deities from Mangareva and the Cook Islands are presented alongside exquisitely carved ceremonial staffs from the Austral Islands and an impressive breastplate from Tahiti made of feather, shark tooth and dog hair. The final section, “Divine Chiefs,” features masterworks created for the elite ruling class of Hawai’i at the extreme north of the region. An important ancestral sculpture of the Hawaiian deity Lono will be presented for the first time in decades alongside intricately woven fiber works and a remarkable feather cape (‘ahu ‘ula) that once belonged to Kamehameha I and represents the high point of the Hawaiian feather and fiber art genre. The exhibition is organized by Maia Nuku, Evelyn A.J. Hall and John A. Friede, associate curator of Oceanic Art in the Metropolitan’s department of the Arts of Africa, Oceania and the Americas. The Metropolitan Museum is at 1000 Fifth Avenue. For more information, 800-662-3397, 212-535-7710 or www.metmuseum.org. 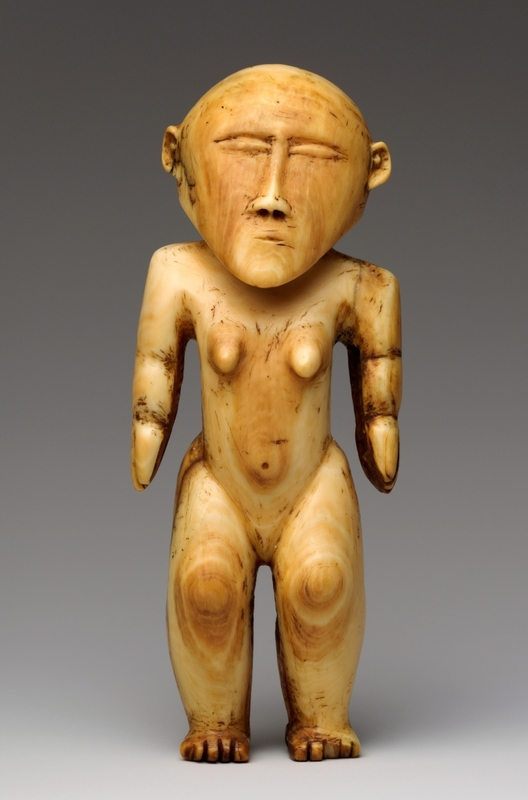 Female figure (‘otua fefine), Tonga, Ha’apai Islands, early Nineteenth Century, whale ivory, 5¼ inches high by 2 inches wide by 1½ inches deep. The Michael C. Rockefeller Memorial Collection, Bequest of Nelson A. Rockefeller, 1979.